She is brave! She is fierce! 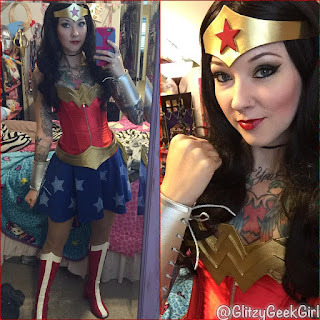 She is .. Wonder Woman! 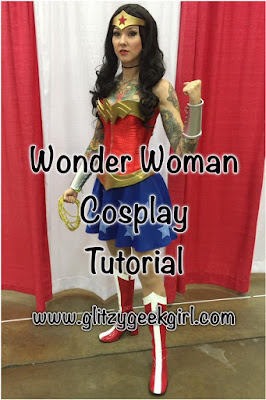 I chose to make a Wonder Woman cosplay to wear to the Dallas Comic Con (now called Fan Expo Dallas) because I wanted to wear a costume that was fun, colorful and a character I admired. 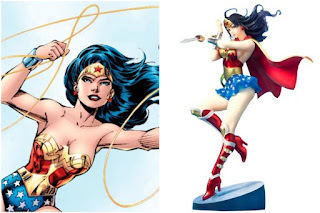 I feel like no other comic book superhero fits that criteria better than Wonder Woman! 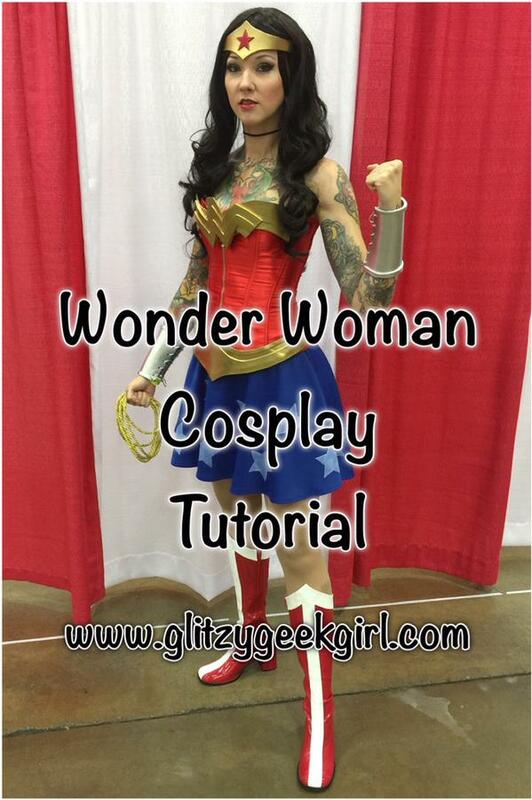 So if you have ever considered making this cosplay for yourself here is my tutorial/walk through/guide of how I made mine! You always want to start out with a reference photo. 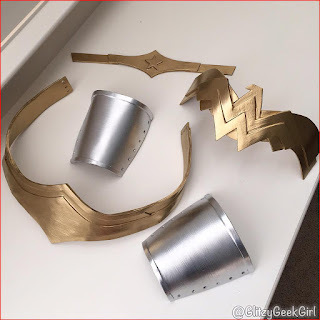 Wonder Woman has had several alterations to her costume over the years, but for myself I wanted to wear a skirt rather than extra short bottoms. 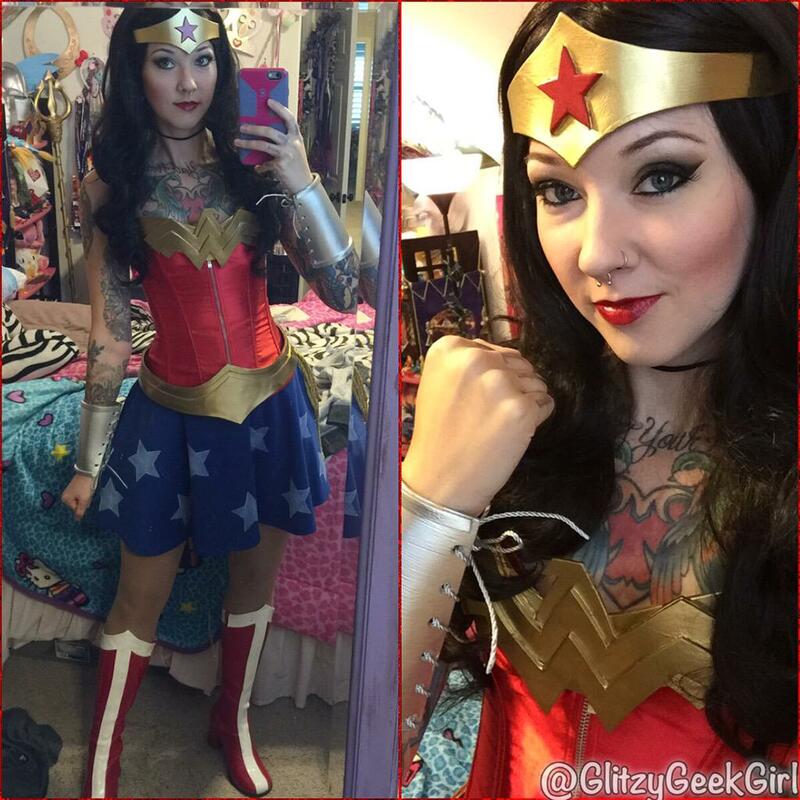 My costume isn't based off of one specific Wonder Woman costume, but rather a mix of many to fit my tastes. This is another reason she appealed to me since I could make it my own and feel comfortable wearing it, but still be recognizable as the character. 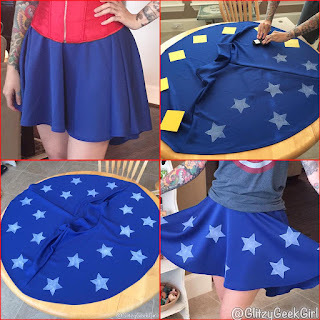 After I researched several reference photos, I began my hunt for a red corset and blue skirt. Sure you could make these from scratch if you want, but due to time and money I usually have a "semi-homemade" attitude. There's nothing to be ashamed of if you don't make every single detail from scratch! So I turned to Amazon and found a corset and skirt that were in my size and would be delivered in time. I made sure not to buy a corset that buttoned or had latches in the front. From past experience, zipper fronts are a lot easier for me to put on when buying a cheap corset. 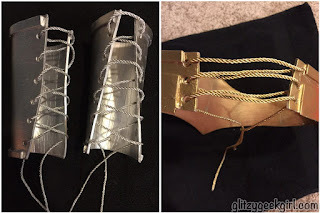 More expensive and well-made corsets have great latches/hooks, but like I said, I was on a budget. The first thing I did was make patterns of all the armor. Most of the patterns I drew myself onto newspaper, but the W logo for the chest piece I printed from the internet. A simple google search will bring up lots of great logos you can base your armor off of. Then I cut all the armor pieces out of craft foam and used hot glue to attach the layers together to give it more dimension. 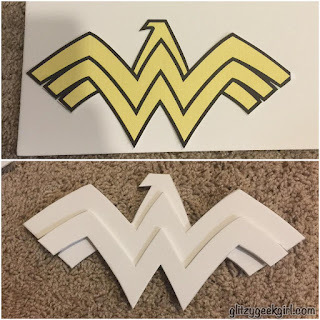 If you bend the foam AS you glue it you can give it a curve so it holds whatever shape you want. 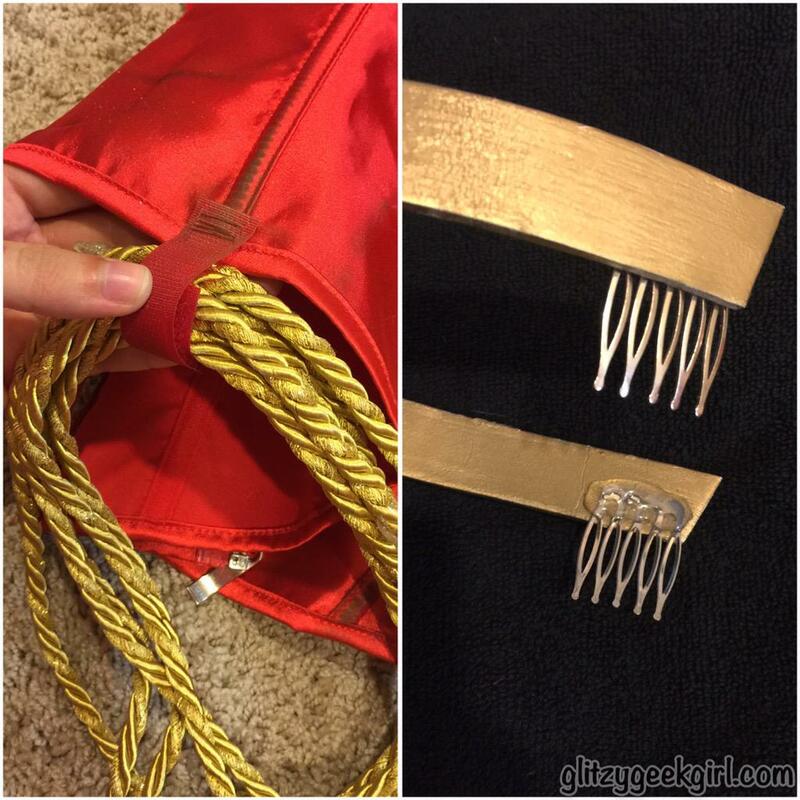 Also, I punched holes in the back of the belt and gauntlets so I would have a place to put the cord that will hold them together. 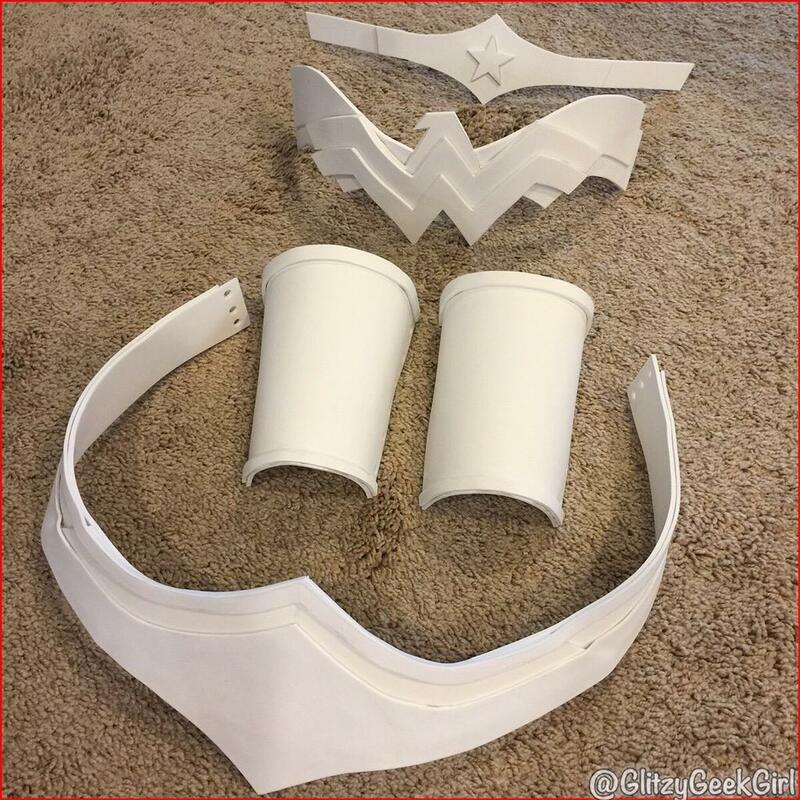 When you are ready to paint your armor, be sure to prime it first with Gesso. I did about two coats of Gesso, let it dry completely, then spray painted with Krylon Foil Metallic. 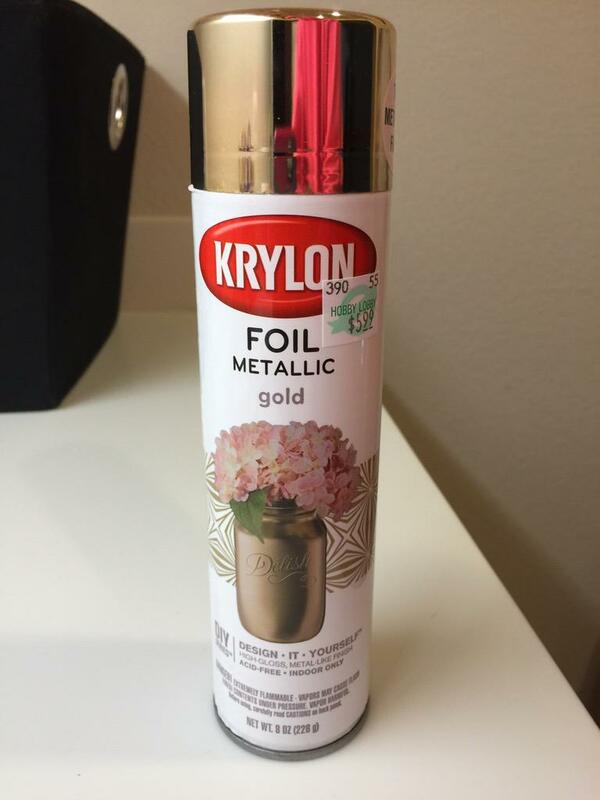 This was after just one coat of the Krylon spray paint and no sealer. I loved how shiny it was! I used silver cord and gold cord to lace up my gauntlets and belt. This made adjusting the fit very easy while wearing the armor. 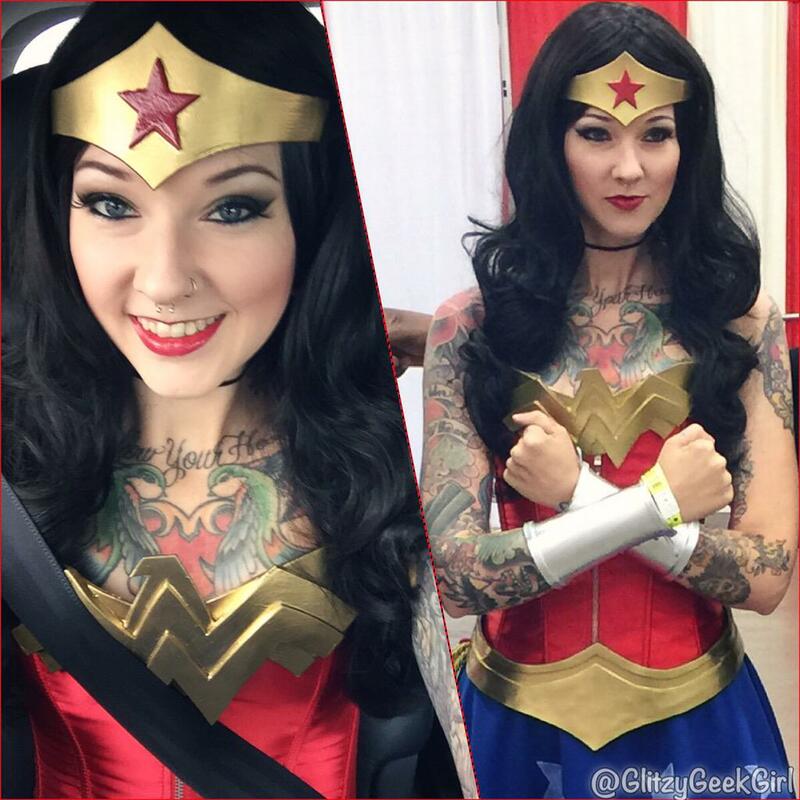 The chest armor was fixed to the front of my corset with velcro. I hand stitched velcro to the corset and glued the other side of the velcro to the back of the armor. 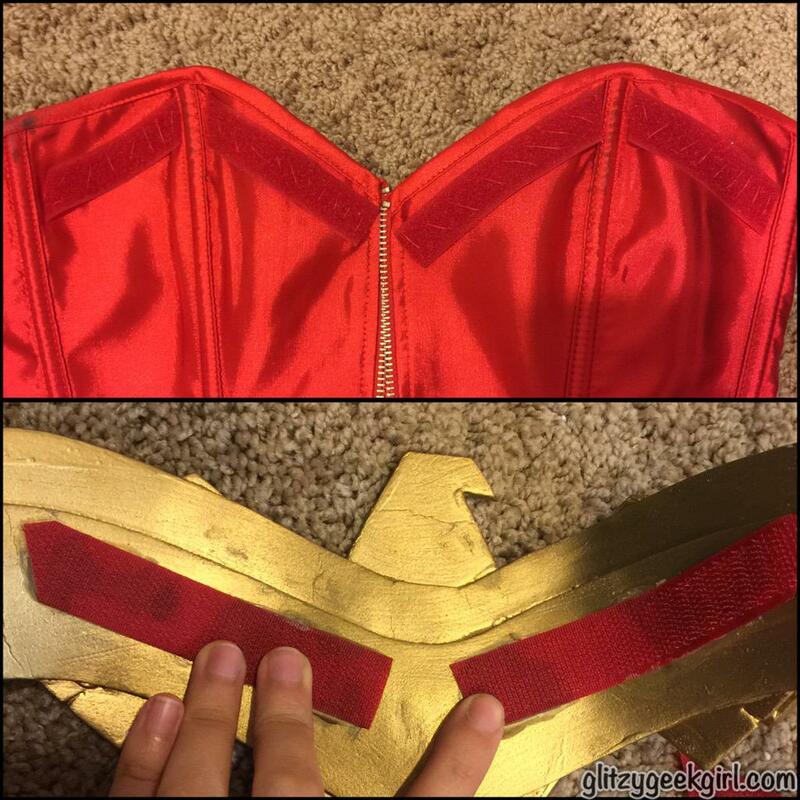 I did this because I couldn't glue the armor straight to the corset since it zips up the front. Also, I didn't want to ruin the corset in case I decide to use this for something else someday. I can easily unstitch the velcro if needed. 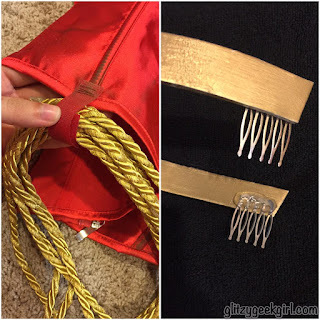 The lasso is a larger gold cord and was worn on the side of my hip by hand stitching a little piece of velcro to the corset. 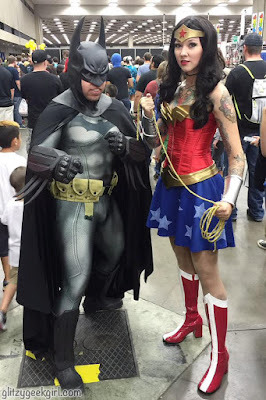 I liked using the velcro because I could easily take the lasso out if I wanted to pose differently in photos. For the crown, I hot glued two hair combs to the back of it. These fit securely into the net of your wig or hair. My skirt was awesome! It was slightly longer in the back and had a comfortable waistband. I laid it out on my kitchen table and used white fabric paint and a star stamp to decorate it. The yellow post it notes were used so I could measure out where to put each star. Be sure to let it dry fully before you try it on. 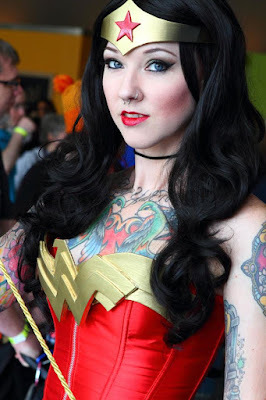 The wig I used was a really dark brown wig I bought several years ago from a cheap store in the mall. It had more curls than the other black wig I owned so I went with it! I would recommend the Ferrari in Black from Arda Wigs, though, if you need to buy one. And my makeup was inspired by this tutorial by Kristen Leanne. It's similar to Taylor Swift's in her Bad Blood video. You look fantastic! 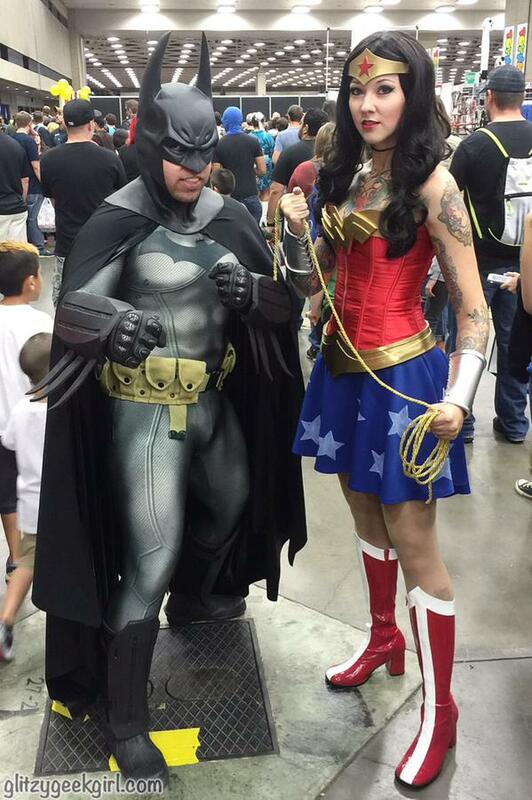 I love how you made the costume and character your own. This was SO incredibly helpful for me. Thank you SO much!!!! where did you get your craft foam from? None of the supplies you listed that you bought come in my size do you know of a place that sells items similar to those in plus sizes? Thank u, this was great and seems so doable! What size craft foam did you use?